Helping people be happy and free through avenues of mind, body and spirit disciplines; is Nikki’s greatest passion. 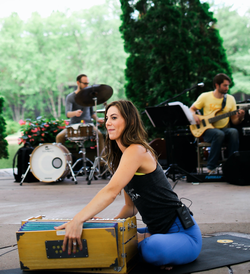 Known for her dynamically masterful and inspirational live-music classes and her strong thematic messages around aspects of purpose, service and faith, she has been inspiring yogis to breathe, believe and achieve for over a decade in the Twin Cities area and beyond. Nikki is a sought after yoga industry leader, teacher trainer, presenter, nutritional therapist, and is the owner and creator of Studio 925, a mobile wellness company that brings yoga, fitness and nutrition classes to the workplace, sports-teams, apartments settings and schools. She also created the history making, Great MN Yoga Get-Together at the Minnesota State Fair in 2017. You can find daily inspiration from Nikki on her FB Blog Page called Exercising Faith.